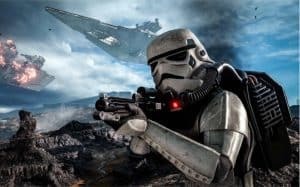 Star Wars Battlefront Sequel Indicated for Fall 2017 Release | Nerd Much? A Star Wars Battlefront sequel will supposedly be coming Fall 2017. Maybe we will have it just in time for Star Wars: Episode VIII? We can dream. Being generous with the definition of “a year,” we can be pretty sure that the game will release sometime next fall. This is a much more narrow release window than the previously announced 2017. Further evidence of this new timeframe is that the response was to a question about how EA would financially make up for sales from Battlefield 1 and Titanfall 2 next year. We can imply that a Star Wars Battlefront sequel would release within a similar window. Some people think it may be too early for a sequel, but it is remember to keep in mind that Battlefront was a very polished game. With just a few more tweaks and game modes, EA could have a great title on their hands. We are definitely looking forward to it.